When I first started photographing newborns, they were for my wedding clients. They already loved the way I photographed their wedding and would invite me back to document their newborn family sessions. I love the way that lifestyle sessions are documentary, natural, and unposed. It's all about you and your new addition and photographing you together as you are with baby. This could be bath time, feeding or just snuggling on the bed or sofa while I photograph you. Posed newborn photography is beautiful, it is simply not for me and my style and your newborn session will be very natural, casual, and candid. I explain that I will be simply capturing you being…YOU! On the day of the session, I show up to my client’s home with just me and my camera gear. Having a baby is a really huge milestone in my client’s lives and they are trusting me, as their photographer, to document their sweetest moments as a growing family. Here are10 tips that really help me have a successful session every time. Take a peek at these 10 tips that will help you feel confident and organized during your next lifestyle newborn session! Once my clients officially book a newborn session with me, I send them tips to prepare. Easy to do's on the day of and I have my clients pay attention to the natural light in their home so we can determine what time of day it is best to photograph their newborn session. Because my family and newborn sessions are photographed in natural light, I use only available light and do not use any artificial light like overhead lights or a flash of any kind. Therefore, it is really important that we schedule the newborn or family session at a time when it is the brightest in your home. I ask my clients to turn off all the lights in the home and watch where the best light is coming in. I photograph mostly in the master bedroom and in the nursery for newborn sessions, but if the light is best in the living room then we'll definitely be photographing there. My clients watch those particular rooms for lighting at its brightest and we schedule them for that time! Beautiful natural light is one of the most important parts of a successful in home newborn session. If your home is generally moodier with darker light don't worry I've got the best equipment and can easily shoot in low light situations but your images will also reflect a darker moodier vibe. The first thing I do when i arrive at the client’s home, after I swoon over their newborn, is get a house tour. Having the client show me the master bedroom and nursery area upon arrival really helps me plan out the session right away. During the tour, I can check out the available light and quickly determine what photographs I want to photograph in what areas. I also keep my eye out for other areas in their home that have great light, such as on the staircase or in their living room, and am mindful of other photography opportunities that the uniqueness of the client’s home allows. Allowing yourself enough time will keep the session running calm and smoothly, while maintaining that relaxing atmosphere for the new parents. I tell my clients that my newborn sessions will be around 1.5 hours, allowing enough time for feedings and changings throughout the session. One of the things I have found most helpful is that it is easier to allow time for the baby to be fed and changed throughout the session than to try and photograph a fussy baby. By allowing time for parents to stop and feed or change their child ensures that everyone will stay happy and comfortable. taking 5 minutes for a little break every once in a while will save you lots of time in the long run! Waiting an entire nine months to meet your baby certainly warrants tha I photograph mom with her new little one. Cuddle her baby really close while standing or lying down on the bed, with her face right next to theirs and simply have her gaze lovingly at them. Keeping mom and baby posed close creates a very maternal photograph. Keeping my clients comfortable and relaxed will show in their photos and help create natural journalistic images. While the mother gets to carry and bond with their baby for nine months, it’s after the birth that the new dad really gets to have his own special moments. So I make sure to photograph dad alone with baby as well! I love having dad's hold their new baby in their hands, as it creates a special photo that both shows a brand new bond and also shows just how little the newborn is in their father’s hands and arms. It’s a great way to show perspective! A lot of care and planning goes into their baby’s nursery, so I make sure I take photos of their newborn in their room. On a changing table or in their crib and I find the mobile is always something fun to photograph. I make sure to have my nikon 24-70mm f2.8 lens on one of my bodies so that I can grab a spacious image of the entire space. 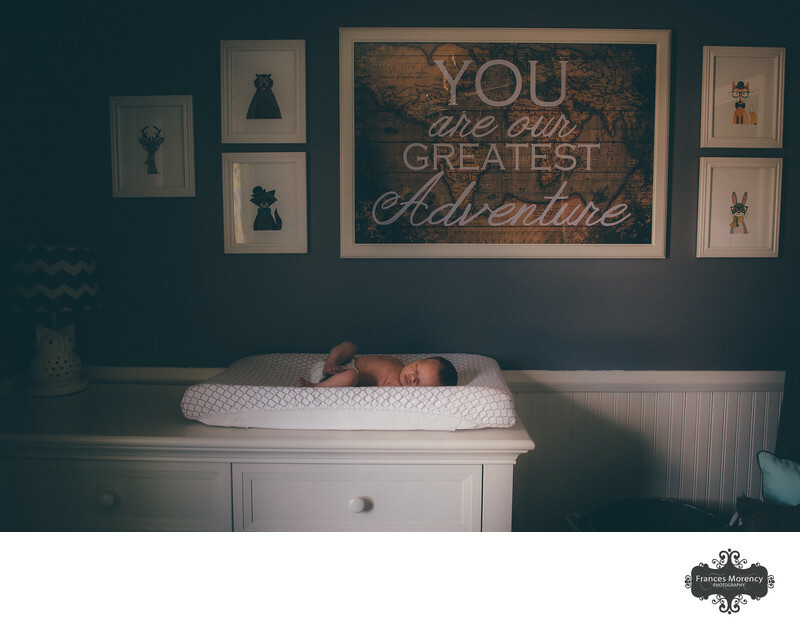 Parents look back on their collection of newborn photos in the following years and, they will be happy I took the time to photograph that room that they spent months perfectly planning. 7. IT’S OKAY TO TELL CLIENTS WHAT TO DO! To be honest, most clients really want you to simply tell them what to do. My clients say I'm a nice bossy and they really appreciate the direction, putting them into flattering positions and I'm not afraid to take control of the session and direct them. They will thank you for it. I love to get my parents really close throughout the session, with their newborn cuddled between them. Having them touch foreheads and gaze at one another, and then down at their newborn, creates a really intimate photo that shows the closeness of a brand new family. if my clients are comfortable, I have them steal a kiss while holding baby and kissing baby toes makes for a really sweet image too!. I take some pictures of their sweet face, an I also take the time to capture all of the tiny details that newborn babies have. While I have photographed newborns from birth to 5 weeks old, I still recommend that my clients book me for when their newborn is around 2 weeks old, as I feel they photograph the best then. Giving the new parents long enough to get home from the hospital and get into a routine, but still is soon enough to capture the newness of their baby. That 2 week window it is also common and normal for some newborns to develop baby acne, so it is best to get their photographs scheduled before that could potentially show up. but if it does, no worries! that's what editing is for ! While we are speaking about editing, I love my soft, creamy timeless family portrait editing style and I particularly love how the skin is so smooth. When I'm photographing the details, I make sure to get photos of their tiny fingers and toes, their ears, and even the top of their heads. I love to lay newborns on the master bedroom bed for this part of the session and get down really low so that I'm on the same level as them with my 85mm 1.4 lens to get just what I want into focus and let the rest of the image fall away into beautiful fuzziness. I don't bring props to lifestyle family sessions, but I do recommend knit hats and knit wraps in solid colours. If your bedding is multi coloured then I highly recommend a blanket in a light colour tone be placed over your bed. One of the main reasons why I love to photograph lifestyle newborn sessions is that they capture those moments of the parents interacting with their newborn. Parents and even their children can one day look back and see just how little their baby was in their arms, or what they looked like at the time. I also try to make sure to get a great family photograph. I capture mainly candid, natural moments of the parents looking at their baby and then have them look at me for a more traditional first family portrait. 10. KEEP CLICKING, EVEN DURING THE CHANGING OR FEEDINGS! I don’t set my camera down for even a second! 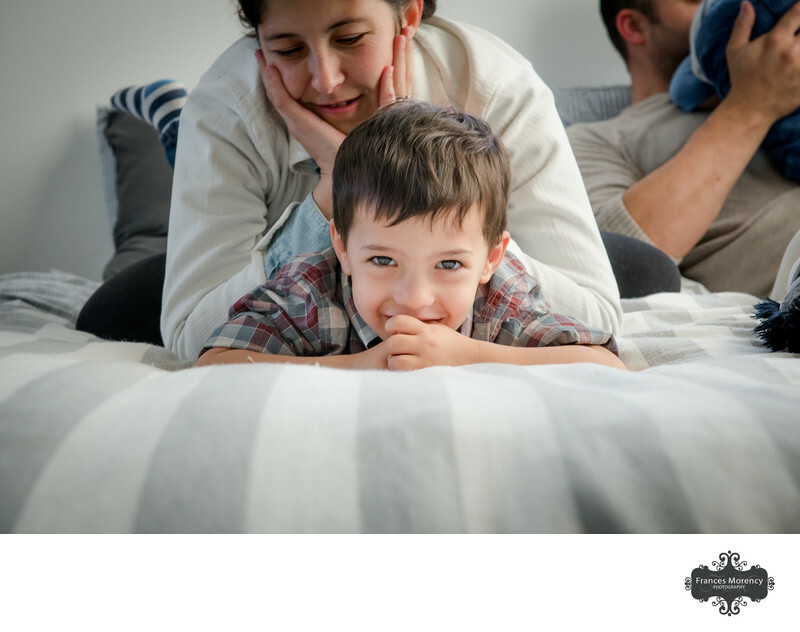 Part of being a lifestyle photographer is capturing those candid moments of the family doing what they do. Newborn families do a lot of feeding, changing, and cuddling. I make sure I take every opportunity to capture moments between parents and their new baby. I had one client that was so grateful that I captured the little intricacies, such as when every time mom changes the diaper her little one would put his toes in his mouth. She was so happy to have those moments documented. For my newborn sessions, I bring my 85mm 1.4G on my Nikon D4 and my Nikon 24-70mm f3.5-4.5 lens on my Nikon D850. I love the low capabilities of these two bodies with my prime lenses. I always bring a step stool or use a chair to get above my clients and their newborns. However, I don't bring props to my lifestyle sessions. These sessions are all about the connections you are having with a newborn in the home. WE DON'T DO ANY BABY BENDING! If you are looking for those really cute images where newborns are positioned in cute poses or pretzel poses I like to say then you will need to go to a studio and plan on booking a few hours. This is a very specialized process with bean bag chairs and props and wrapping techniques and heaters and studio lights. However, that doesn't mean that we can't quickly wrap your sweet baby in a favourite blanket and photograph it. I welcome a couple outfit changes at every session and cute hats are always a welcome addition to any image. The session fee is for Frances' time and talent to capture the images on the day of the session and the hours it takes to edit. The session fee is required to reserve your date. Approximately 3-4 weeks after the session, you will be presented with an online gallery from which to make your purchase decisions. These mini 20 min. sessions are pre - scheduled on a Sunday. They include quick portraits of your family at one location.